Beth Lipman is a glass artist who lives and works from a country-side studio near Sheboygan Falls, WI. Her talent is recognized well beyond the borders of our state. She has received numerous awards including a USA Berman Bloch Fellowship, Pollock Krasner Grant, Virginia Groot Foundation Grant, and a Louis Comfort Tiffany Foundation Grant. Lipman has exhibited her work internationally at such institutions as the Ringling Museum of Art (FL), ICA/MECA (ME), RISD Museum (RI), Milwaukee Art Museum (WI), Gustavsbergs Konsthall (Sweden) and the Renwick Gallery of the Smithsonian American Art Museum (DC). Her work has been acquired by numerous museums including the North Carolina Museum of Art, Brooklyn Museum of Art (NY), Kemper Museum for Contemporary Art (MO), Smithsonian American Art Museum (DC), Jewish Museum (NY), Norton Museum of Art, (FL), and the Corning Museum of Glass (NY). My art explores aspects of material culture through still lives, site-specific installations, and photographs. 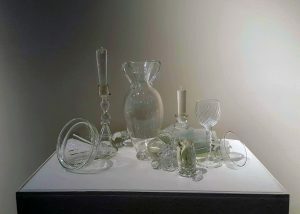 For the past decade, I have created compositions in hand-sculpted glass. The works are portraits of individuals and our society through inanimate objects. Every object created, whether broken, “flawed,” or “perfect” is incorporated into the final composition, literally capturing a moment in time. The process of creating defines the final composition; mimesis is abandoned. Mortality, consumerism, materiality, and temporality, critical issues since the inception of the still life tradition in the 17th century, continue to be relevant. 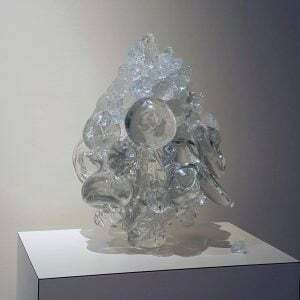 As is true of the two works exhibited in Sharper Edges, Lipman often works in clear glass. From her viewpoint on the transience of Life, consumerism and materiality, color prevents the reflection and refraction of light; clear distills the essence of the object. Vessel with Handles and Candlesticks, 2018, and Fruit and Cullet Centerpiece, 2011, which recently was acquired by the museum. Sharper Edges: Women Working on the Edge of Glass, examines select female artists speaking with distinct viewpoints on social issues of politics, gender biases, stereotypes, and environmental concerns. Contemporary artists on view include the grande dame of contemporary studio glass, Audrey Handler, as well as Susan Taylor Glasgow, Beth Lipman, Lisa Koch, Stephanie Trenchard, Carmen Lozar, Kristin Thielking, Deanna Clayton, Lisa Beth Robinson, and Jennifer Caldwell. The exhibit is on view until February 17, 2019.